Windows 7 has many useful and less known features within it and they work like a charm . 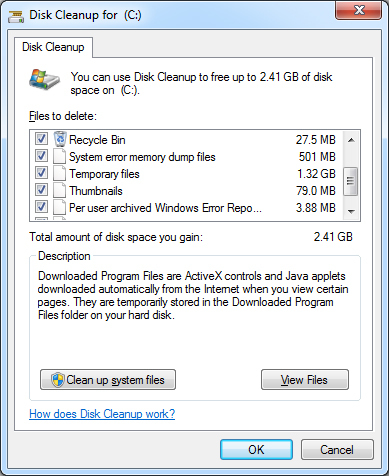 One search feature is the windows disk cleanup tool . you might have seen the disk cleanup option while checking a drive’s properties . Most of the time it gets unnoticed ,but its a small tool that performs it part efficiently . Lets find out how . With time , The windows installation drive in our computers piles up a lot of hidden junk files . These files include windows log , temporary files , thumbnails , error dump files and a lot more . Most of these files are not needed by your computer and occupy a significant amount of storage space . Deleting these files will free up a significant amount of space on your windows drive which can help you to speed up your PC and other purposes . Lets use this tool and free up some space . Step 1: Open my Computer and right click on your windows installation drive and select properties . Step 2: Click on the disk cleanup button and wait for windows to scan for junk files . Step 3: Around 2.41 GB of my windows installation drive was comprised of junk files . You can select from the list of junk files to delete . If you think some of them might be important to you then you can deselect them . Step 4: Select the junk files from the list and click OK to delete them . 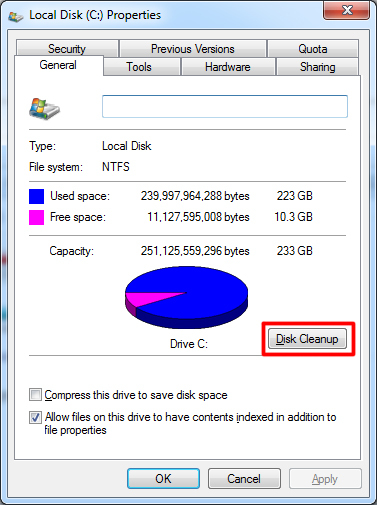 Disk cleanup is one of the less known features in windows .There are a lot more such features in windows ,which we will be exploring up very soon . Until then keep subscribed to this blog for more exciting updates .